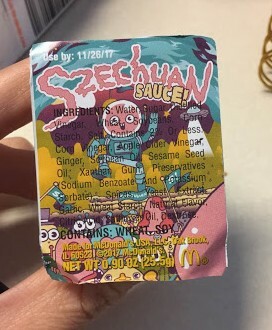 Szechuan Sauce. An extinct sauce from McDonald’s Mulan promotion. However, this sauce has reached cult status due to an appearance in Rick and Morty. Though let’s be real, if you are reading this article you already know that. What you’re here to find out is where you can get your hands on this sauce! Well have no fear, we have you covered! Just a little background as to why Szechuan Sauce is making a 1 day comeback. McDonald’s is adding a new permanent menu item to excite customers: Buttermilk Crispy Tenders. These new tenders are made with 100% white meat chicken and no artificial flavors, colors or preservatives. McDonald’s Buttermilk Crispy Tenders are seasoned, battered and breaded to perfection and pair perfectly with nine McDonald’s sauces, which include: Creamy Ranch, Honey, Honey Mustard, Hot Mustard, Spicy Buffalo, Sriracha Mac Sauce, Sweet ‘n Sour, Tangy Barbeque, and the new Signature Sauce. Each location will have very limited amounts of sauce and they will likely go quick! In addtion to the Szechaun Sauce giveaway, McDonald’s has worked with Delicious Design League’s artists to create custom “hero” posters for their “Obsauced” campaign. On Oct. 7th they will also be giving away 10 Hero “Obsauced” Posters in 14 restaurants (4 restaurants will have BOTH sauce and posters) themed after their dipping sauces. Below you can see the poster designs being offered! Good luck to those brave enough to attempt capture of the elusive Szechaun Sauce!